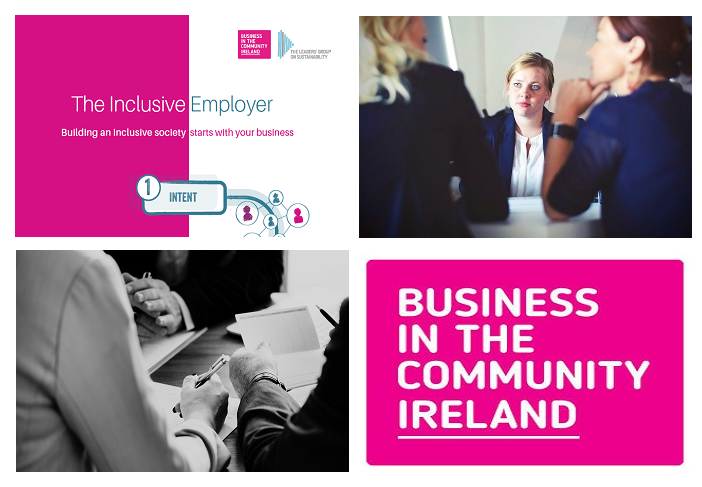 Business in the Community Ireland (BITCI), the business network for Corporate Social Responsibility and sustainability, has recently launched a practical how-to guide for employers to promote social exclusion, reduce inequality and combat poverty (28th February). ‘The Inclusive Employer’ blueprint is the work of the Leaders’ Group on Sustainability, a coalition of senior management and CEOs of Ireland’s top businesses from various sectors including energy, telecoms, tech, finance, transport, professional services, pharma, agriculture, retail and food. These companies have all achieved the Business Working Responsibility Mark, the NSAI audited standard for CSR, and they work collaboratively to address social, environmental and economic priorities. The publication is a result of the work of the Social Inclusion sub-group. The group comprised representatives from CRH, Dawn Meats, Deloitte, eir, M&S, SSE Ireland, Ulster Bank, Veolia and Vodafone as well as experts from BITCI’s employment and education teams. The group was co-chaired by M&S and Veolia. Top priority for the Social Inclusion sub-group was to explore a business response to growing inequalities in Irish society. The blueprint is a practical guide on how to create inclusive workplaces, while also reducing social inequality, and is designed as a best practice tool for employers on how-to secure, develop and nurture diverse employees. BITCI Chief Executive Tomás Sercovich said the blueprint provided a clear pathway for human resources departments, strategic planners, recruitment experts and talent retention specialists to finally eradicate inherited disadvantage which often runs through families and communities. “At a time of almost full employment, talent retention and creative recruitment that nurtures business values and adds impact and dynamic to the workplace has never been so important,” the CEO added. Set hiring targets for those vulnerable to social exclusion and be ambitious. Rewrite job descriptions to be more inclusive. Train all staff on unconscious bias, diversity and inclusion. Ask your supply chain about their diversity and inclusion and reward suppliers who demonstrate a commitment. Engage with outreach programmes targeted at education and employment. To view or download the Inclusive Employer guide, please click here.